Thousands of people, including scores of officers from departments around the country, paid their respects to fallen DART Officer Brent Thompson on Wednesday. Thompson, 43, joined the department in 2009 and is the first DART officer killed in the line of duty in that department's history. 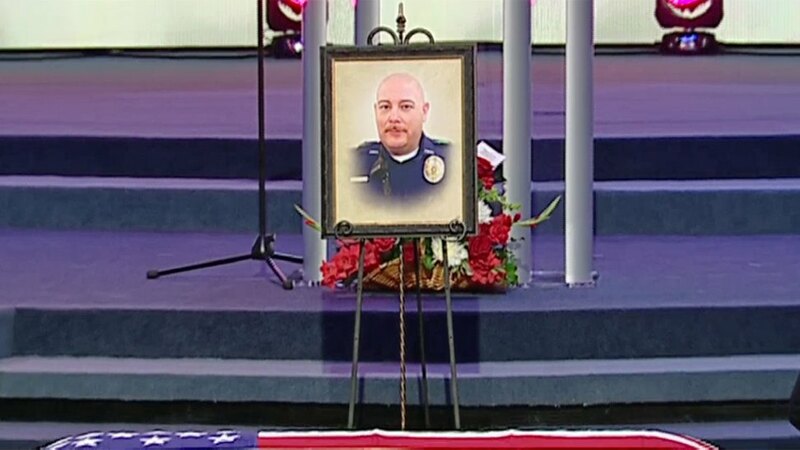 His widow, Officer Emily Thompson, also serves as a DART officer. The two were newlyweds, having exchanged their vows just two weeks before the deadly ambush that also took the lives of four Dallas Police Department officers. "I married the most amazing, caring, loving, selfless man I've ever known. Brent was a fighter, a warrior, a hero and a scrapper. The kind of guy you'd want fighting with you," Emily Thompson said, fighting back tears. "But Brent was also an amazing husband, father of six beautiful children that he talked about all the time. Brent was a son, a brother, an uncle and all-around phenomenal guy." 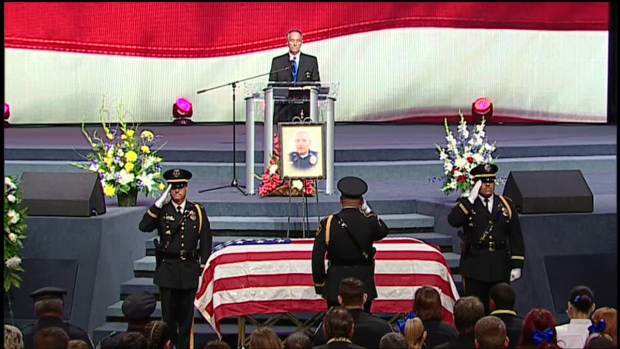 Memorial service for DART officer Brent Thompson held at the Potter's House July 13, 2016. Thompson was one of five police officers killed July 8, 2016 when a gunman ambushed police officers following a peaceful protest in downtown Dallas. "Brent was there for whoever needed him, whenever they needed him, and it didn't matter what they needed him for," she added. She said she has been thrilled to spend the rest of her days with her husband. And then on "Thursday, July 7, 2016, at 8:58 p.m., that was all ripped from me in an act of senseless violence," Emily Thompson said. She also had some powerful words for her brothers and sisters in blue. She said that even though she's heartbroken, she will continue to serve the public as a DART transit police officer. "Though I'm heartbroken and hurt, I'm going to put on my badge and my uniform and return to my street, along with all of my brothers and sisters in blue," she said. "We will not, we can not, we shall not let the acts of a coward break us. On Brent's behalf, I ask you to continue on and press on. He has your six." 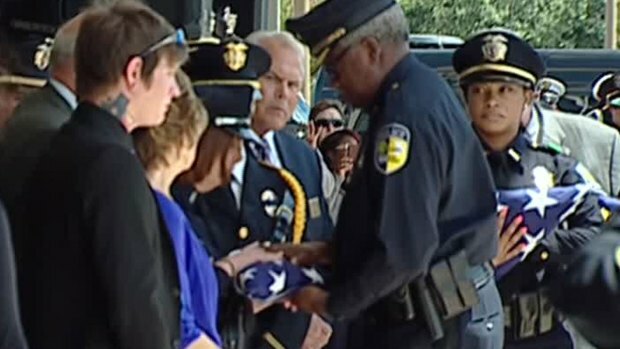 During the memorial for DART officer Brent Thompson, family is presented with a folded flag previously draped over his casket before the officer's last call, a flyover and the playing of taps. There's no timetable for her return. DART spokesperson Morgan Lyons said she can take as much time as she needs. "That's her plan. That's her hope. And we've said from the beginning, whatever you need. We have a big family. We're ready to take care of her," Lyons said. Brent Thompson had been standing at the DART West End train station very close to the site of the attack. When gunshots rang out he ran towards the danger, and was murdered while trying to protect the public and save the public. "Has there ever been a better example of our true values in our department? Service before self. Not just Brent, but every officer who was there, who ran toward the gunfire, who ran to help the people," said DART Police Chief J.D. Spiller. "Emily, I lost a son. But I still have a daughter here," Spiller said. "I thank you for letting us know Brent the way you knew him, the way the whole family knew him, the way Corsicana knew him. I thank you for that." "We grieve his loss, we honor his courage, we push forward, lift it up, emboldened by the promise of better days," Spiller said. Brent Thompson is a Marine veteran. He served tours in Iraq and Afghanistan. He also worked as a Corsicana police officer. Brent Thompson has six children. They all took the stage during his funeral and said they're comforted by the fact their dad was a hero to his family, his friends, his city and his country. "This is really hard for all of us, but our dad taught us how to fight under pressure, and that's what we're doing today," said daughter Katie Thompson. "His only goal in life was to provide a better life for his children, for us. Whether it was becoming a Marine and going overseas, he worked so, so hard to provide for us his entire life. He worked two jobs a lot of times. He worked countless hours of overtime. Only so that he didn't have to see us struggle," Katie Thompson added. "Everyone grows up thinking their dad is a hero. But the six of us up here can hold our heads up high knowing that our dad is a hero," said daughter Sandy Thompson. "He was not just a hero to Dallas, but to the world. He fought overseas for many, many years." She then said an emotional goodbye to her father, her hero. "One thing I would always say to my dad when he walked out the door is, 'Goodbye, daddy. I love you. Be safe.' And today I say my final, 'Goodbye, daddy. I love you. Be safe,'" she said. Officer Brent Thompson will be buried in a private service on his family's farm in Corsicana. Three DART officers were wounded in the attack. The agency identified the injured officers as Officer Omar Cannon, 44, who joined the department in July 2009; Officer Misty McBride, 32, who joined DART in March 2010; and Officer Jesus Retana, 39, who joined DART in April 2006. All three are expected to recover. Two civilians were also injured, Dallas Mayor Mike Rawlings said Friday morning.